Triple Layer Brownies are soft and gooey, flavorful and have a slight crunch to them. They will be the talk of the dessert table. Triple layer brownies came to my mind when, quite frankly, it was a Monday. I literally stood in my kitchen, watched my husband come through the door exhausted from work, and knew we both needed a pick me up. After all, our day time schedules have been busy but our night time schedules are even crazier. That’s what happens when you have kids from the age of four up to fourteen, I guess. Sometimes, my friend, you just need a little chocolate in your life to keep you going. That is my motto, anyway. My husband would add cream cheese to that motto, so to be the good wife that I try to be, I added cream cheese to the plan. To add a little kick to the mix, I made graham cracker crumbs to go on the bottom of the brownie. Okay, time out here. Does anyone else think graham cracker crumbs, mixed with butter is just about the yummiest thing to eat? By the spoonfuls? Um, I do. 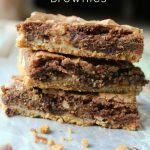 Next time you whip up a batch of cracker crumbs for your cheesecake or, of course, these triple layer brownies, be sure to take big spoon and indulge in the cracker goodness. The cream cheese layer has a simple blend of cream cheese, egg, vanilla and sugar. Of course, we just mentioned the graham cracker crumbs. Yes, whip this up for your family, your friends or your church potluck. It will be a hit. 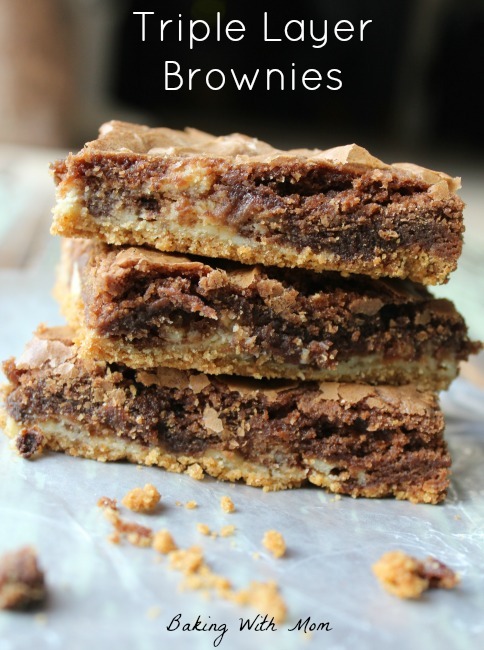 Triple Layer Brownies are a sweet mix of brownie, graham cracker crumbs and cream cheese. With an added bonus of chocolate chips, these brownies are delicious!